Wool felt top and bottom with neoprene rubber center. Billet and girth loops. Fits naturally under the saddle. Measures approx 21 1/2" at spine, 20" drop, 1/2" thick, & flap at widest is a little over 17". This wonder wash pad is constructed of the highest quality synthetic acrylic blend. Features a contour shape to eliminate slipping plus girth and billet straps. Machine-washable pad. Spine measures 19 1/2”, drop measures 18 1/2”. Perfect for everyday use yet nice enough for the show ring. Quilted cotton contour pad with shock-absorbing foam padding for weight bearing areas, reducing fatigue. 1 each color available. This wonder wash pad is constructed of the highest quality synthetic acrylic blend. Features a contour shape to eliminate slipping plus girth and billet straps. Machine-washable pad. Spine measures 21”, drop measures 20”. Perfect for everyday use yet nice enough for the show ring. This wonder wash pad is constructed of the highest quality synthetic acrylic blend. Features a contour shape to eliminate slipping plus girth and billet straps. Machine-washable pad. Spine measures 19”, drop measures 18”. Perfect for everyday use yet nice enough for the show ring. Double fleece shaped dressage style English saddle pad with billet straps & girth guides. Spine measures 20” with 15” wide flaps & 20” drop from back seam. Great for dressage or straighter front English saddles. Clean & in excellent used condition, only showing minor wear on edges from saddle friction. Two layers of thick polyester fleece with web nylon billet straps. Measures 21 1/2” total length at spine, 18 1/2” drop & 16” flaps at widest point. Minor dirt, some friction marks on lower edges. Two layers of thin polyester fleece with web nylon billet straps & girth guides. Measures 19 1/2” total length at spine, 20 1/2” drop & 17” flaps at widest point. Nice thinner pad for less bulk, cut with longer flaps for bigger saddles or could possibly use with an Australian stock saddle. Doesn’t look like it was ever used. 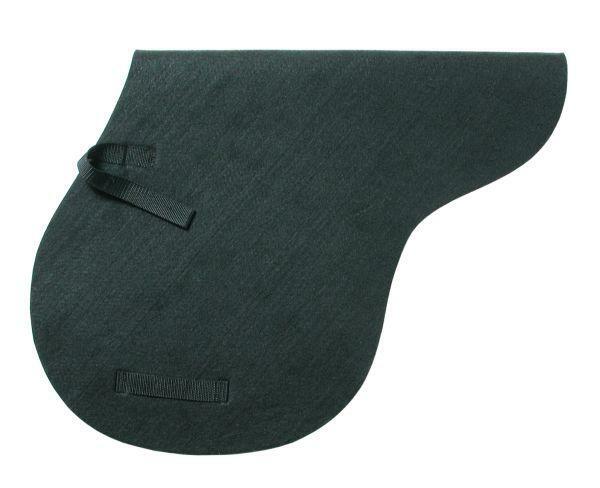 This fleece saddle pad features a contour shape to eliminate slipping, cutback at withers, & girth and billet straps. Machine washable pad. Spine measures 19”, drop measures 18 1/2”, flap 15" at widest part. Perfect for everyday use yet nice enough for the show ring. Use with a dressage, park/saddle seat saddle or all purpose saddle with long flaps. Excellent slightly used condition but has a small section of missing fleece on top side only that is hidden under the saddle flap. Clean, NO dirt on side next to horse. Fleece English saddle pad with straight long flaps for dressage type saddle. Has billet straps & girth guides. Nice double sided fleece pad. Measures approx 19” at spine with 19” drop, flap width approx 14". Well used, not white anymore, fleece wear/friction marks at bottom edges, makes a good schooling pad. Fleece Dressage saddle pad with a thick layer of polyester filler quilted to a brushed 100% cotton fabric. Adjustable Velcro straps(instead of billet keepers) & girth keeper strap at bottom. Easy Care: Machine washable and dryer safe. Spine length & drop are both approx 21” with flap width approx 13-14". Similar product to Toklats Medallion Super Quilt. Quilted cotton underside is no longer white with lots of stains, some friction wear to bottom edge of flaps. Double sided fleece Dressage saddle pad with adjustable Velcro straps(instead of billet keepers) & girth keeper strap at bottom. Easy Care: Machine washable and dryer safe. Spine length & drop are both 21” with flap width approx 13-14". Looks like new, don't think it has been on a horse. 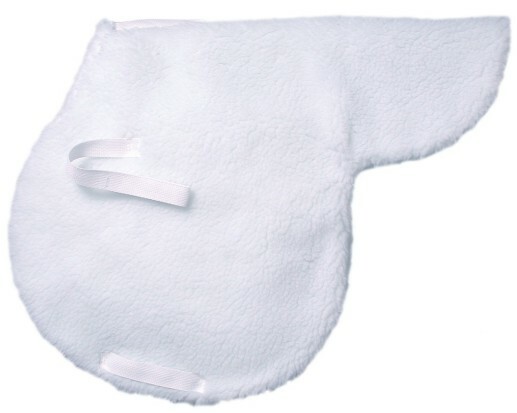 Classic white fleece topped contoured English pad with quilted cotton bottom that absorbs sweat and keeps horse's back cool. Moisture wicking quilting. Billet straps & girth guide at bottom. Machine washable. Spine length & drop are both approx 19” with flap width at widest point approx 16". Brand unknown as this is not as thick as the Toklat Super Quilt, but similar otherwise. Quilted cotton underside is no longer white, some friction wear to bottom edge of flaps, otherwise excellent used condition. Quilted cotton English saddle pad with brushed cotton lining, 1 3/4" diamond pattern, billet straps & girth guides. Approx 22” long at spine, 19” drop & 17 1/2” at widest point of flap. tagged Large, made in China. Small frayed spot on binding at very back & minor hair/pilling to flannel underneath. Size- L 22” x 35"
This 1/4” thick covered foam type saddle pad features a contour shape, & billet straps. Machine washable pad. Spine measures 21 1/2”, drop measures 21”, flap almost 15" at widest part. Perfect for everyday use. This is Not a fleece pad, so less bulk under saddle. Use with a dressage saddle or all purpose saddle with long flaps. Clean, no dirt or hair, but does have several brown stains. 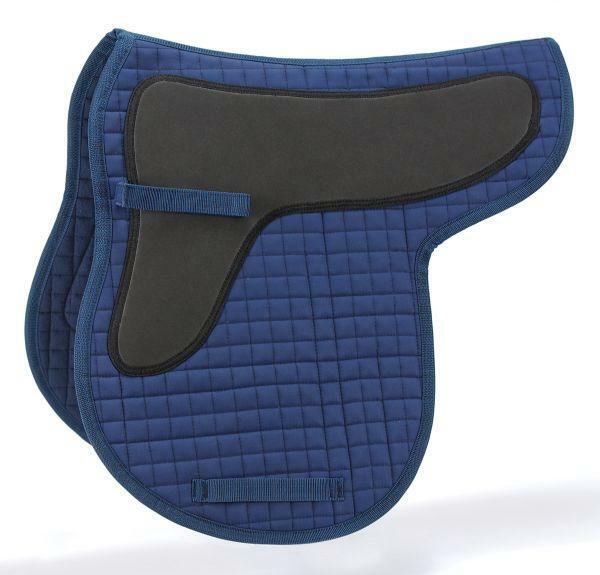 Old style single layer polyester fleece contour pad for small/childs dressage saddle, with web nylon billet straps. Very lightweight. Measures approx 17” at spine, 16 1/2” drop & 12” flaps at widest point. Clean, some stains & some friction marks on lower edges. Great schooling pad for a small saddle. Single layer polyester fleece contour pad for an AP or forward seat saddle, with web billet straps. Measures approx 17 1/2” at spine, 16 1/2” drop & 13 1/2” flaps at widest point. Clean, nothing fancy, just simple schooling pad.